Recently, members of the public have noticed mysterious patches of black slime emerging on some of Washington’s most famous landmarks, and experts are baffled as to how to get rid of it. We wanted to understand a bit more about this strange phenomenon, so we checked it out and detailed what we found below. It really is quite strange! What we discovered is that the black slime itself is known as Biofilm and has been creeping over our beloved National Mall and other iconic buildings for well over a decade now. Thomas Jefferson and Abraham Lincoln memorials have also been affected. 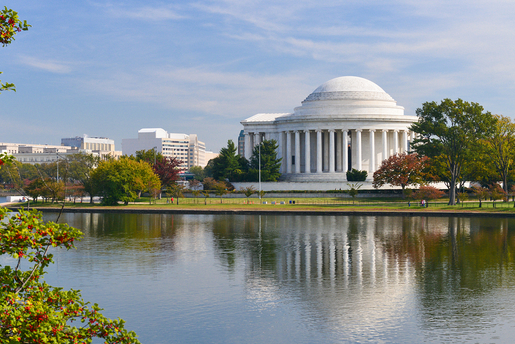 The famous Jefferson Memorial, in particular, is gradually turning gray which is affecting the white marble. CBS recently reported that the biofilm is not actually slime at all, but more of a powder. The black slime has also been spotted at Arlington National Cemetery, Congressional Cemetery and on the Washington Monument. This has resulted in some members of the public accusing the parks department of not cleaning its own sites well enough due to the biofilm resembling dirt. While the substance has been referred to as slime, it is dry to touch and doesn’t leave any marks on your hands. The main issue with this is that because it is dry, it is extremely tricky to clean off as a result. The National Park Service have been examining a few of the sites that are affected but have been having difficulty in their attempts to clean the biofilm from the buildings due to its robust and resistant nature. Basically, the difficulty arises due to the biofilm being made up of a colony of microscopic organisms which thrive on stone surfaces where nutrients are available. This allows the slime to grow gradually and many famous buildings all over the world have suffered the same fate. Rain can erode small crevices in stone surfaces gradually over time and this creates the perfect breeding ground for these organisms. However, it is going to take more than a hose to get rid of the stuff! Overall, treatment of biofilm can be tricky as there isn’t currently a known method to remove it permanently. This is partly due to the need to ensure no further damage to the building and also to try and ensure that the solution is permanent so that it doesn’t grow back. This is a difficult balance to get right, especially when the building itself is hundreds of years old and a fragile and much-loved part of the city. The National Park Service is in the midst of testing a variety of clean solutions to try and find the one that is least damaging to the stone. It also has to be cost-effective and environmentally friendly. This has even resulted in a team of global scientists being consulted to help tackle the problem. The slime might not be available to view for too much longer if these efforts prove fruitful, so why not check out our tours and you can see the slime for yourself.